I joined this fundraiser because working with dogs and puppies cats and kittens for the last year and a half at North Shore Animal League, I've seen how much each and every dog, puppy, cat or kitten we get, has an impact on our lives and see how happy families get when they find their loving rescues, like how I found mine. How much these animals are in need of loving and caring homes. My first dog, Trevor was a rescue from Tennessee, and he was the best dog ever. He knew which toys were his, he always wanted to go outside and play. He was unconditionally loved by me and my family. Unfortunately he passed last year in September but he waited for me to say goodbye and yes, i miss him desperately. Just recently I rescued my dog that I have now, Teddy and now, I can't imagine me without him either. All the tail wags, all the love he gives, the kisses and the cuddles and most importantly, I rescued him and he rescued me. 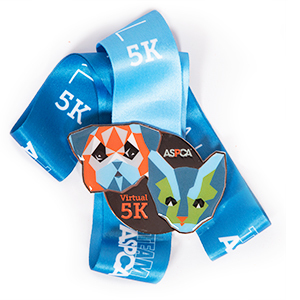 So that's why joining ASPCA virtual 5k this year is important to me. I want to raise money to help these cute and cuddling animals. I want to raise awareness for all the pets who were left abandoned, hopeless and in desperate need of love. I want to raise money so they can get loving homes and loving families and they can get the help they need. I want others to rescue their pets like I rescued mine. I'm doing this for you Trevor and Teddy. My angels. And for all the dogs and puppies, cats and kittens who were effected by the latest storms in Harvey, TX or down in Florida, I'll be running for you too!